Tired as we are of the BMW E30 in LeMons (second in popularity only to the Civic/CRX/Integra), we're forced to admit that the E30 has proven to be a pretty decent cheap endurance racer. 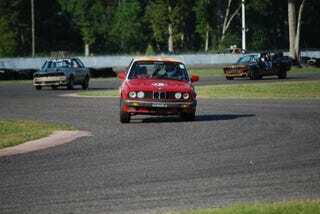 If you start the race with an E30, you've got nearly 50-50 odds of keeping it running all weekend. Of course, if your E30 does break, you're pretty much totally screwed, because you'll never figure out that crazy electrical system.